Inspired by nature, medical scientists have developed a flexible and biocompatible light-activated glue that works on wet tissue. And remarkably, it's as strong as traditional sutures. The beating heart is a tough place to try sticking things together. When surgeons need to get in there to fix something that has gone amiss, their options for sealing incisions are mostly limited to stitches or liquid adhesives. Image: A sandcastle worm (Phragmatopoma californica) in the laboratory of Russell Stewart, University of Utah, making a tube out of sand (yellow) and beads of zirconium oxide (white). Courtesy Fred Hayes/University of Utah/Wikipedia. 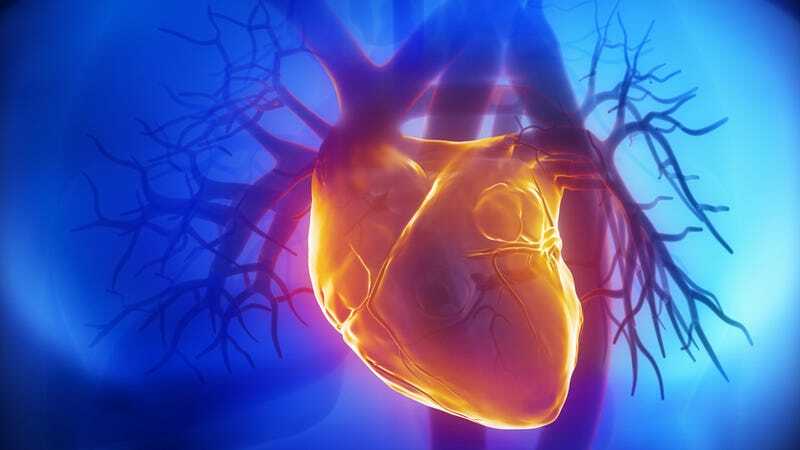 But each of those comes with its own problems when a doctor is attempting to repair the cardiac wall or blood vessels, places that constantly stretch and contract while also being slick with blood. By their very nature, stitches damage the tissue they pierce. They don't create an immediate and total seal against leaking fluids. They're also challenging for doctors and can take quite a bit of time to complete. Liquid adhesives, meanwhile, offer limited sticking power or can be toxic. One of the most widely used liquids, cyanoacrylate, is the acrylic resin that gives Super Glue its stick. Now, researchers are reporting success finding the next generation of material to bind tissue together—a liquid adhesive inspired by nature. In preclinical trials, the glue even worked in the highly dynamic and slippery environment of the beating heart. "This adhesive platform addresses all of the drawbacks of previous systems in that it works in the presence of blood and moving structures," said Dr. Pedro del Nido, the chief of cardiac surgery at Boston Children's Hospital and one of the senior authors of a study published in Science Translational Medicine on Jan. 8. "It should provide the physician with a completely new, much simpler technology and a new paradigm for tissue reconstruction to improve the quality of life of patients following surgical procedures." In their paper, the team said they looked to animals that have mastered adhesion for their inspiration. Among those they investigated for cardiac applications were the secretions made by insects to keep their feet from sliding on smooth surfaces and the glue produced by slugs to hold fast to watery substrates. They settled on trying a synthetic adhesive called poly(glycerol sebacate acrylate) (PGSA), which was inspired by sandcastle worm secretions and is elastic and transparent. These reef-building marine worms collect building materials floating in seawater and glue them together to make their homes. Other researchers have found that the creature's sticky protein-based secretion sets in 30 seconds in cold, salty water. PGSA has an advantage over its natural predecessor—when ultraviolet light is applied to the synthetic adhesive, it sets and cures in five seconds. PGSA is also composed of ingredients that naturally occur in the human body, meaning they can be broken down harmlessly over time, the authors say. The combination of material and UV, which they call a hydrophobic light-activated adhesive (HLAA), "was not easily washed out from a tissue surface and retained its adhesive strength during prolonged contact with blood," they wrote in their paper. "Once activated, the HLAA provided stronger adhesion than standard sealants such as fibrin, even in a highly dynamic environment." They tried the glue on large blood vessels under high blood pressure and cardiac walls in rats and pigs, which stood in to replicate common human surgical procedures like repairing cut blood vessels and heart wall defects. They used the material as both a stand-alone suture and also to glue on a repair patch in areas commonly needing surgery. Image: The application of glue to a vessel defect. Image courtesy of Randal McKenzie. "This study demonstrated that the adhesive was strong enough to hold tissue and patches onto the heart equivalent to suturing," said Dr. Nora Lang, a Boston Children's Hospital cardiac surgeon who also authored the study. "Also, the adhesive patch is biodegradable and biocompatible, so nothing foreign or toxic stays in the bodies of these patients." Image: The waterproof, light-activated glue developed by Brigham and Women's Hospital, Boston Children's Hospital and MIT researchers can successfully secure biodegradable patches to seal holes in a beating heart. Courtesy Karp Laboratory. They say their HLAA could be used to diminish the invasiveness of surgeries, reduce time needed to complete operations and improve surgical outcomes. Biomedical engineer Jeffrey Karp, a senior study author who works at Boston's Brigham and Women's Hospital said the advance could find good use among the most fragile of patients—babies born with broken hearts. "About 40,000 babies are born with congenital heart defects in the United States annually, and those that require treatment are plagued with multiple surgeries to deliver or replace non-degradable implants that do not grow with young patients," he said. Top image: CLIPAREA l Custom media/Shutterstock.